Philosopher and mathematician Rene Descartes struggled with the question of whether or not the mind’s perception of dreams represented reality. (Library of Congress). The rationalist philosopher and mathematician René Descartes (1596–1650) was born at La Haye, in Touraine, France. After attending the Jesuit college of La Fleche, he went to Holland in 1618 to serve in the army of Maurice of Nassau, and then traveled in Germany. His first substantial work was the treatise Regulae ad directionem ingenii, which was printed in 1701 although it was never completed. It dealt with Descartes’s preoccupation with method as the clue to scientific advance. 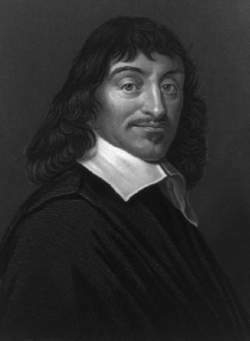 By 1634 Descartes had completed a scientific work, Le morrde, which was suppressed after he heard of the condemnation of Galileo for teaching the Copernican system. In 1637 he published three treatises on physical and mathematical subjects—Geometry, Dioptric, and Meteors—prefaced by Discours de la méthode, which represent a compressed exposition of the foundations of the Cartesian system. In Discours de la méthode Descartes introduced his method of systematic doubt in his attempt to answer the basic question, “What can I know?” which he hoped to answer by critical reflection on his beliefs. His method was to suspend belief in anything in which he could find or imagine the slightest grounds for doubt. He suspended belief in the entire physical universe, including himself; in God; in the past; and even in the truth of mathematical propositions. Among the arguments by which he extended his doubts are the false judgments we commonly make due to illusions of the senses and, in particular, the illusions of dreams, to which he frequently referred. Beyond the abstract use of dream experiences to cast doubt on the veracity of sense experiences, Descartes himself had some important personal dreams. On the night of November 10, 1619, he had a series of dreams that he interpreted as an answer to his desire to find a method that would enable him to pursue truth as a life occupation. According to his interpretation of the dreams, which he claimed were a divine sign, his destiny was to search for truth by applying the mathematical method—by which he meant analytical geometry, in particular—to all other studies. He had always been in the habit of recording his dreams in his journal, which he referred to as his Olympica. At some point during the seventeenth century, this journal was lost, but the contents are known today because of the efforts of the Abbé Adrien Baillet. He had access to the Olympica before it was lost and published a paraphrased version, La vie de M. Descartes, in 1691. It is through this record that we know about a dream Descartes experienced, in three parts, on November 10, 1619. The following is an account of the Abbé Baillet’s version of the events that unfolded in the first, nightmarish act of the dream, as described in his La vie de M. Descartes. After he fell asleep he imagined he saw ghosts and was terrified by them. He felt a great weakness on his right side, and, believing he was walking through streets, was forced to lean over to his left side so as to be able to continue his journey. Ashamed to be walking in this way, he made an effort to stand up straight, but he was foiled by a violent wind which spun him round three or four times on his left foot. With great difficulty he managed to drag himself along, fearful of falling at every step. Then, seeing a college that was open, he entered it hoping to find some respite from his affliction. He tried to reach the college church in order to say his prayers, but on the way he realized that he had passed a man he knew without acknowledging him. He tried to retrace his steps in order to pay his compliments but was again foiled by the wind which blew him back towards the church. Then, in the middle of the college quadrangle, he saw another person who called him by name and told him that, if he wished to find Monsieur N., he had something for Descartes to give to him. The gift appeared to be a melon that had been brought from some foreign country. He was surprised to see that people who had gathered round the man in the quadrangle to chat with one another were able to stand firmly upright on their feet, whereas Descartes had still to walk crookedly and unsteadily, even though the wind had abated. At this point he awoke in pain, fearing some evil spirits were trying to lead him astray. Having fallen asleep on his left side, he now turned over on to his right side. He prayed to God to protect him from all the misfortunes which might threaten him as a punishment for his sins. He recognized that his sins were grievous enough to call down on him the wrath of heaven, although in the eyes of men, he had lead a relatively blameless life. He lay awake about two hours, pondering the problem of good and evil, and then once more fell asleep. In Descartes’s dream, he was forced to lean on his left (corresponding to the unconscious) to continue walking, since his right (corresponding to the conscious) was so weak that it could no longer support him. By giving the left a higher significance than the right, the dream reminded Descartes, who thus far in his life had believed only in reason and rejected both his instinctive and religious life, of the importance and necessity of his irrational side. In another dream Descartes came across two books with which he was unfamiliar. a dictionary and a poetry anthology entitled Corpus poetarum (The Body [Collection] of Poets), containing some small portraits engraved in copperplate, which was open at the line Quod vitae sectabor iter (What is the path to the way of life? ), followed by a fragment presenting the alternative, Est et non (To be and not to be). The dictionary represented “all the sciences gathered together,” whereas the anthology, full of sentences by poets, recalled the discovery of enthusiasm and imagination. The union of philosophy and wisdom, represented by the two books, constituted the answer for which Descartes was looking and subsequently informed his waking intuition of the unity of all the sciences.